Put aside the bucket and sponges once and for all. This year, clean your car quickly, gently, and effectively with a single multitalented tool. Good things come to those who wait: That may be sound advice for life in general, but if you’re a car owner, it’s best to ignore that old adage. Rather than wait around for crud to accumulate, I’ve learned that, if you want to protect the finish on your vehicle, it’s far better to clean early and often. Be aware, however, that when cleaning a car, it’s possible to do more harm than good. Poor technique or improper materials leave the clear-coat finish riddled with micro-scratches that not only compromise the longevity of the paint job, but also lessen resale value. Fortunately, cleaning your car the right way doesn’t have to call for a full afternoon of hard labor. It requires only that you work with the right equipment. In fact, I was pleased to discover that you really need only one tool for the task, so long as you’ve got the HYDE PivotPro Boat/Auto Cleaning Water Wand. With PivotPro, I did a much better job than my local car wash, and for much less money. Park the car in a shady part of the driveway and begin your cleaning only after the car has cooled to the touch. Once it’s ready, grab your PivotPro. That’s right—you won’t need all those sponges and buckets today. Simply connect your PivotPro to the garden hose, then start blasting away loose dirt and debris from the roof on down to the tires. Unlike other wands in its category, the PivotPro features a patented pivoting nozzle that rotates along a radius of 135 degrees. This means that merely by pulling or pushing the slide grip on the barrel, you can adjust the spray angle. Rather than stretching or stooping to clean a hard-to-reach area, you can simply pivot the nozzle to direct the water where you want it to go. All the while, you can remain standing comfortably upright on your own two feet. After rinsing the entire vehicle, proceed to cleaning what’s so often the dirtiest component: the wheels. Here, water alone may not be sufficient; the nooks and crannies of your wheels, like mine, might benefit from a scrubbing. But with PivotPro, there’s no need to go digging in the garage for a suitable brush. 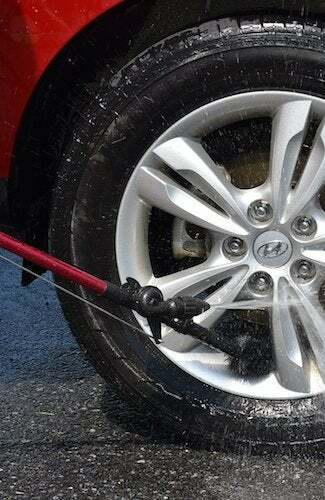 The tool comes with a spindle brush that’s specially designed to fit into wheel wells and other tight spots. Just lock that brush into position and, capitalizing on the tool’s 46-inch length, get into all those crevices where even hands wouldn’t fit. To give the front of the wheels an extra scrub, trade the spindle brush for the rectangular, nylon-bristled brush with a rubber bumper. For maximum cleaning power, scrub even while spraying the area with a steady stream of water. Without knowing any better, some people use normal dishwashing soap or another cleaning agent borrowed from the kitchen. 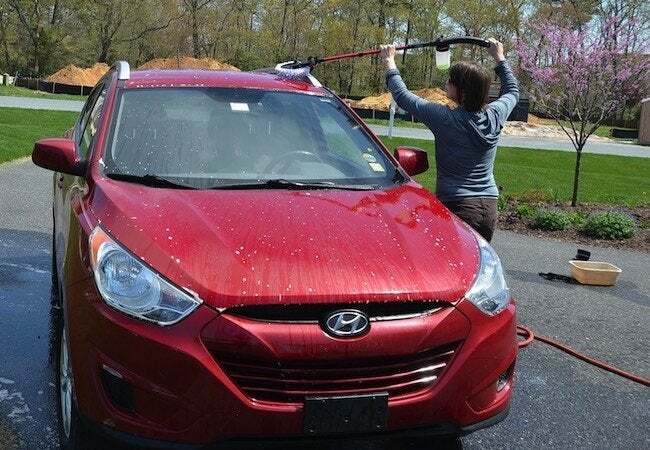 That’s a bad idea, it turns out, as such products strip away the protective wax coating on your car, leaving its finish vulnerable to nicks, scratches, and stains. Having learned from the error of my ways, I purchased a dedicated car-washing solution and was ready to proceed. Whereas in the past I would have added my detergent to a bucket full of water, thanks to PivotPro’s clever soap-dispensing functionality, this time the process was remarkably hassle- (and bucket-) free. After filling the built-in mixing reservoir and setting the desired soap-to-water ratio, I sprayed down the entire car, from top to bottom, with soapy water. It must have taken me—oh, I don’t know—two minutes? Next, I switched out the spindle brush in favor of another attachment included with the HYDE PivotPro Boat/Auto Cleaning Water Wand—a microfiber pad. Car aficionados recommend microfiber above all other materials, and now that I’ve used it, I understand why. As I ran it over the soaped-up car, the pad seemed to be floating away the dirt and debris, not driving them into the finish. Be careful, though: Pause your work every now and again to inspect the microfiber for anything that might leave a scratch. Another tip: Wipe vertical surfaces (e.g., doors) with a stiff-armed up-and-down motion; with horizontal surfaces (e.g., hood), use a left-to-right motion. Work in sections, and as you finish each one, toggle the switch on the PivotPro to rinse the soap off the section before it has the chance to dry. You can always let the car air-dry after a final rinse-off, but doing so runs the risk of a spotty result. To avoid streaks, dry the car with a microfiber towel by either blotting or dragging the material slowly across the surface. Even better, treat the microfiber with spray wax or instant detailer first. The lubrication from either treatment helps prevent the microfiber from marring the perfect finish you’ve managed to restore by carefully following the earlier steps. It’s gratifying to tackle even a simple job like washing the car. But there are tangible incentives as well. 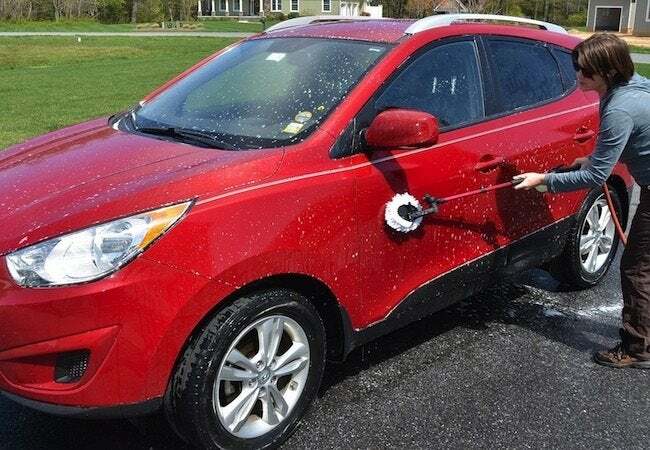 For instance, sidestepping car wash fees can end up saving you some real money, especially if you’re cleaning your vehicle as often as you should. In the end, however, I was most impressed by the fact that, armed with PivotPro, doing all this myself wasn’t a chore—it was actually sort of fun!